hands/feet are less of a concern given how small a unit is. Like they basically only need to exist, but if they look off too say so. the depth of the body and like developing muscles basically is later. 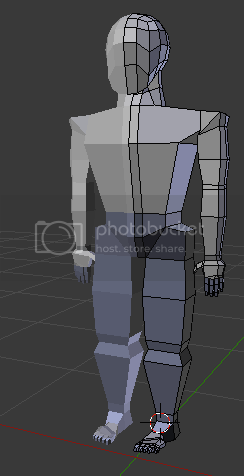 I want to get the basic shape right first (and make those damned hands which takes much longer than you'd think, joints seem to be the most difficult part, and a hand is basically a bunch of joints in a small area). Basically what I'm looking to do here is make a base Human. Then I can load this base unit and easily scale things like shoulders, hips and what not to make it male or female. Then add muscles and whatnot that makes the unit itself look more unique. But if I build a basic Human and then add a bone structure and make all the weights and rotations and whatnot right on a basic Human it would save a ton of steps for each additional unit down the line. Does the bone structure work well? Looks leg heavy. Looks like good base for knight unit or dwarves. http://z-studios.deviantart.com/art/...s-v2-438538019 <--- ha s whole series for a Chess game I've been waiting see what he does with it. Honestly, the scale there is pretty good. Maybe make the humerus slightly longer and shorten up the forearm? It's pretty close, though. You probably don't even need to do that if it's too much trouble. Definitely make the hands a bit bigger, maybe 20-30%? But, yeah, like Meletus said, this dude definitely lifts. Monstrous calves. I would lengthen the shin length a hair. Aside from that, not a bad launching point. it has a skeleton now, but I haven't made the bones work correctly to one another yet and their ranges of motion and whatnot. But it's still the beginnings of a base. details to make the human unique is much later. I just hate the bones so having that basic structure all made up to be a starting point for each additional is useful. They all end up around the same size as well this way which is good.